According to American evangelist Harold Camping, the Rapture was supposed to have occurred on May 21, 2011—the date was moved back five months to October when nothing happened. Apocalyptic preacher Ronald Weinland predicted that the world would end on September 30, 2008. This date was also revised to May 27, 2012, and then May 19, 2013. In a similar vein, No Man’s Sky was supposed to have been released on June 21, 2016—that particular rapture was pushed back to August 9. Though the fact of fandom is hardly unique to No Man’s Sky, the degree of devotion the game’s fans show is noteworthy for its intensity. The occasional visit to the No Man’s Sky’s subreddit, for example, reveals a particularly intense depth of feeling: upon learning that the game had gone gold one fan suggested that the master disk should be placed in the Smithsonian. 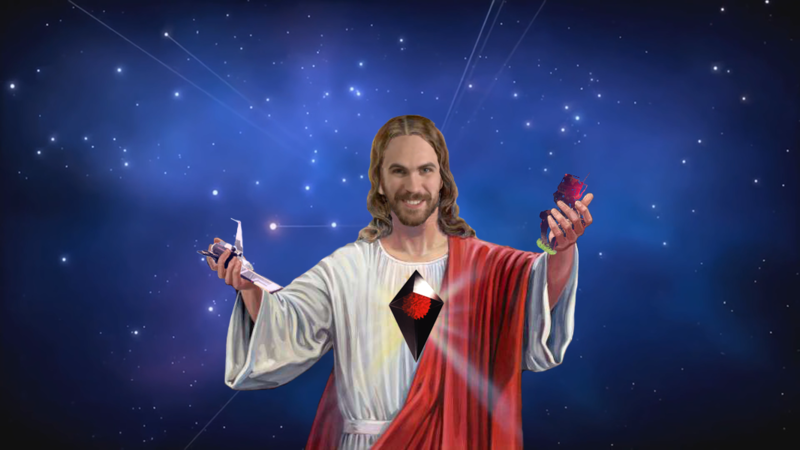 Earlier, another fan photoshopped the lead developer Sean Murray’s face onto a typical image of Jesus. Months ago, one fan claimed that the game will “make my dreams come true!” But all of this is just naked, good-hearted enthusiasm that exists for good reason—it’s difficult to think of, Spore (2008) aside, a game so ambitious and that has received such support in the wider cultural landscape. Murray was invited onto the Late Show with Stephen Colbert, after all. And there was that New Yorker profile. But the darker side of this energy is the well of possessive rancor felt by some members of the community. When a Kotaku scoop announced the game was being delayed, one fan was so desperate to prove Kotaku wrong that they phoned over thirty GameStops for shipping information to rebut the claims, while others lamented that the vacation time they had booked to allow for a truly immersive first taste would likely go to waste. Murray noted that he had received death threats in reaction to the delay’s announcement. Present also in the community is the converse of enthusiasm: exhaustion, faithlessness, and fear. “I’m out of patience, and faith,” says one anonymous commentator. Another describes themselves as simply exhausted. A third posted a thread with the title “I’m getting… scared,” only to receive reassurances of the game’s expected quality. Taken together, both extremes point to a depth of feeling comparable with—even identical to—religious fervor. The New Yorker piece even hinted at this element in its title, “World without End” being a phrase from the Gloria Patri, a part of the Catholic Mass: “As it was in the beginning, is now and ever shall be, world without end. Amen.” But the specific kind of religious fervor the buzz surrounding the game resembles that of an apocalyptic faith. Thanks to disaster movies, the Book of Revelations, and Christian Evangelicalism, apocalypticism connotes a dramatic, permanent, and often metaphysical upheaval. The Day after Tomorrow (2004) is, in a sense, apocalyptic; so too is the more conventional Left Behind series of novels. In many ways, however, the emphasis on physical destruction is overstating the case. Apocalypticism merely refers to the passing away of a “darker” age, and a progression into a more just one. It doesn’t necessitate the absolute, metaphysical destruction of the world and its divine replacement: the Third Jewish Revolt (132-136) had apocalyptic dimensions in that its leader, Simon bar Kokhba, was named as messiah on the basis that he would lead his people to freedom from Roman rule. Put another way, he would lead Judea from a dark age of pagan rule to a more godly one. This concern with the materiality of apocalypse—the way in which the unveiling is concerned with politics or the social fabric—has dropped out of the word’s connotations. But it was present in the earliest forms of, at least, Christianity. The author of the Gospel of Luke, for example, uses the word “saviour” (original Ancient Greek: sōtēr) to describe Jesus. But this word bears a distinct political meaning in its original language: while it was a title given to Greek gods, it was equally a title given to political and military leaders. Ptolemy and Antiochus, generals under Alexander the Great, were given the epithet because they brought some measure of stability as they divided Alexander’s empire among themselves. The first Emperor of Rome, Augustus, was similarly named saviour, among his many, many other titles. In the same vein, religious movements we are tacitly more familiar with also liked to emphasize the material world—St. Paul instituted one of the core tenets of the early Jesus movement (the name given to what would become Christianity in the first century CE) by articulating the promise of a bodily resurrection. Ideas of salvation and apocalypse can then have a worldly element: they are political and social; physical, not merely metaphysical; literally mundane, not otherworldly. Nevertheless, the wellsprings of apocalypticism remain constant. The need for the drastic turnaround is rarely going to be absent, whether you’re a second-century Judean struggling under the Roman yoke, or a 21st-century modern dissatisfied with the restrictive conventions of current videogames. The promise of an apocalyptic belief is that the current situation will be replaced by its utter opposite. This age of darkness will be replaced with an age of light; you are a slave, but you will be free. “Blessed are they that mourn: for they shall be comforted,” says Christ in the Sermon on the Mount. In this instance, the moral dimension of the framework—where the believer, at least, hopes that they are on the right side of things—is not present. But the sense of absence and the need for fulfillment is present nevertheless. The question of what kind of absence the game can fill is impossibly broad—the human condition is one of longing. Any attempt to describe a specific void would be undone by particulars. But in a way, this caveat doesn’t matter: if the promise of No Man’s Sky is the infinite, unrepetitive experience of the universe, surely it’s up to the task of slaking man’s infinite desire? One fan marked July 18 by pointing out that there were just “21 days until the universe is ours.” And the universe is a very large place: surely you can find in the profound depths of an illimitable sandbox the cure for what ails you. But what happens if this apocalypse fails to meet expectations? St. Paul had to deal with his own brand of disenchantment: the Early Jesus Movement was convinced that they were living in the last days, and that any moment Christ would return to usher in the apocalypse. When older members of the church began dying off before this promise could be fulfilled, St. Paul was able to massage (or patch?) the doctrine. His vital change instructed that those who had “fallen asleep” would be raised again at the end, with Christ’s own resurrection serving as a model. The apocalyptic faith was still present, even as its specific contours had changed. The lesson here is that faith evolves—Christianity in the first century does not perfectly resemble Christianity in the ninth century. So, too, will go the expectations for No Man’s Sky, where the promise of patches and digitally-delivered updates can serve to mollify the faithful into believing that the infinite is not upon them yet, but after a few years and enough developer support, it will be. The game’s possible failures, when married to the promise of improvement, will become the substance of things hoped for. Now for the regular caveats: this apocalyptic dimension to fandom is not limited to No Man’s Sky and its devotees. Rather, it’s a recurrent enthusiasm that follows any kind of novelty like a shadow. But the community for No Man’s Sky has managed to provide enough examples of this kind of faith in the game to make it emblematic—again, what other game received time on late-night television? What other game offers a sandbox larger than our galaxy, for only eight gigabytes of space on your hard drive? The end of the world may come like a thief in the night, but the videogame industry needs a hard deadline. So: the next rapture—when the faithful will be taken from this world and into a better one—is set for August 9. For the rest of us, life will carry on as usual.